Yesterday, some very special visitors stopped by Henry Street Settlement, including someone who, as a young child, had actually met Lillian Wald, the visionary progressive reformer who founded the Settlement in 1893. 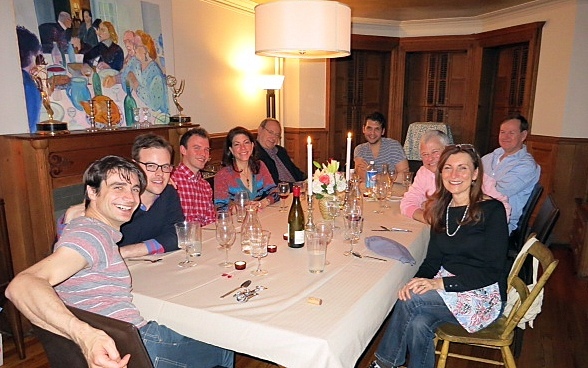 We were honored indeed to welcome our visitors into our historic dining room. 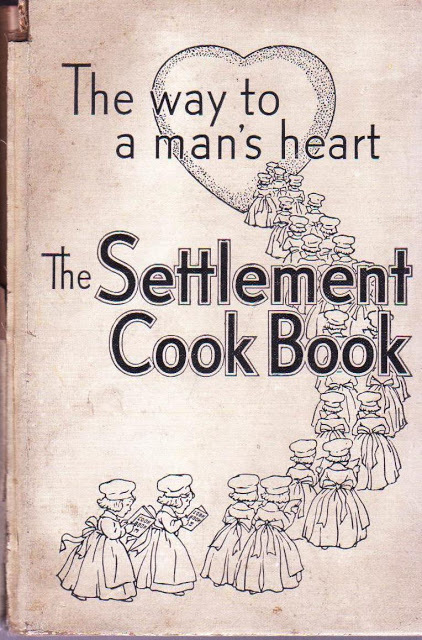 In anticipation, I decided to bake something from The Settlement Cook Book which, though published by a settlement house in Milwaukee, features many of the same immigrant foods served at Henry Street in the early 20th century. It took just a minute to select a recipe from this 622-page tome, first published in 1901. (My copy dates from 1936.) 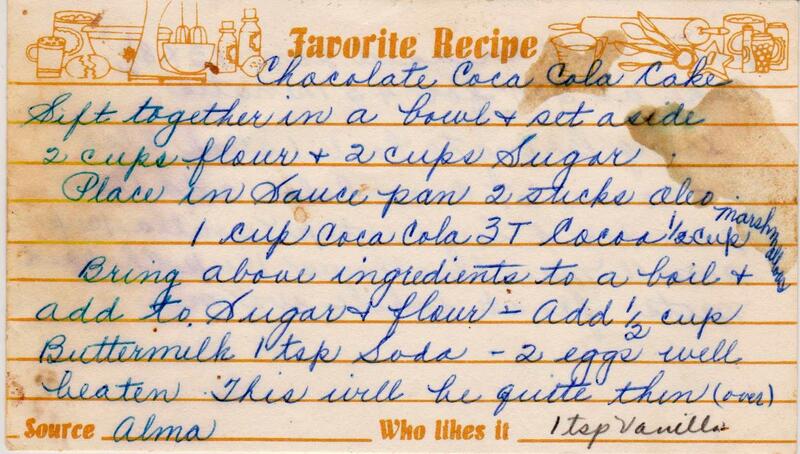 I mean, what could be more welcoming than old-fashioned chocolate cupcakes? 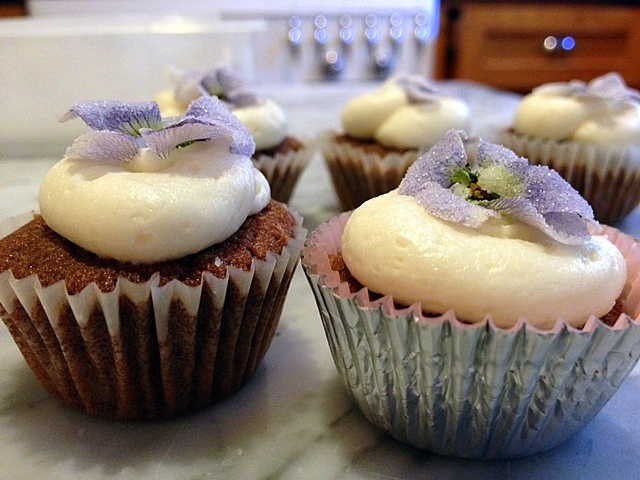 I "cheated" and frosted them with a modern-day vanilla buttercream (from a Magnolia Bakery recipe). 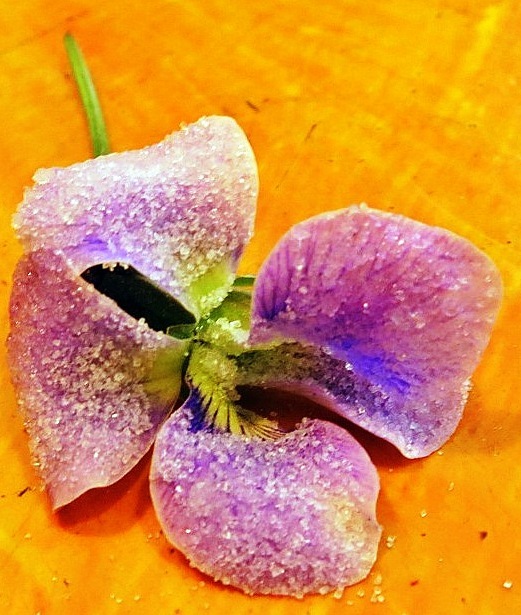 But even topped with the creamy icing, the cupcakes looked too plain for our special guests -- until I remembered the gorgeous crystallized violets I had made this past weekend. Et voila, the perfect petit fours! 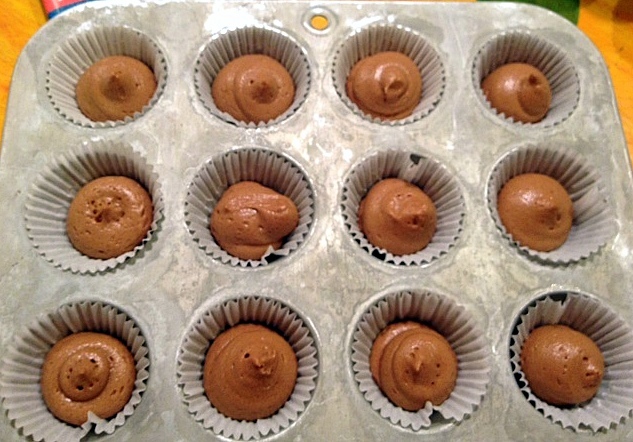 The cupcakes are truly simple to make. 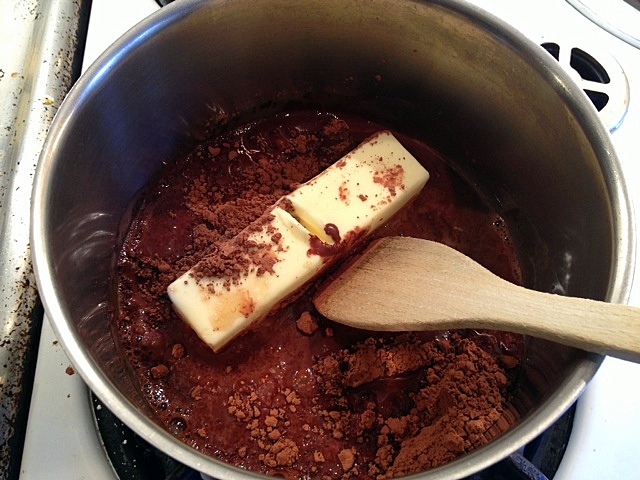 Mix the butter and sugar; add the egg and blend in one square of unsweetened, melted chocolate. 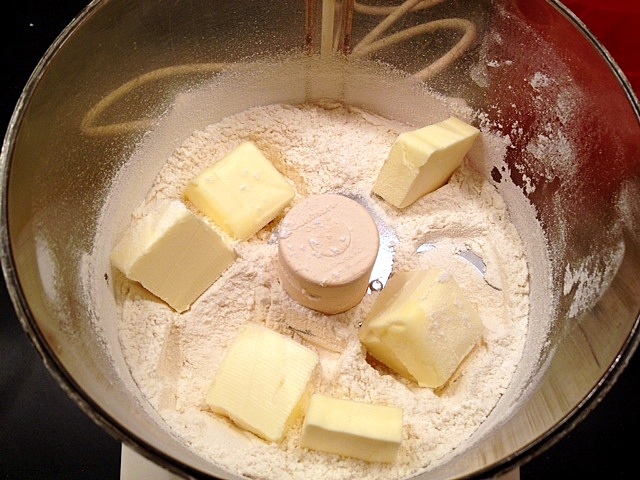 Alternately add the flour/baking soda mixture and buttermilk, starting and ending with the flour. 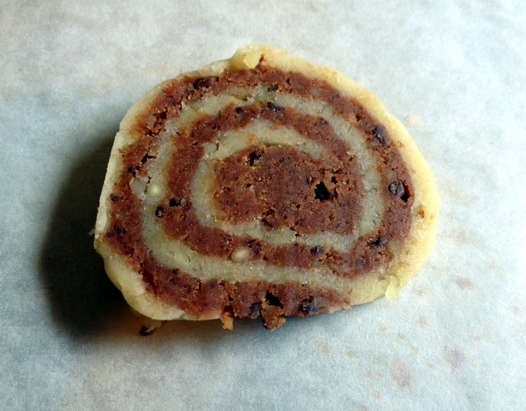 The batter will be rather thick, and I found it easier to pipe from a pastry bag with a round tip. I used mini-cupcake tins, but one pays for their adorableness with the extra time it takes to fill them. Still, I think it's pretty good value. 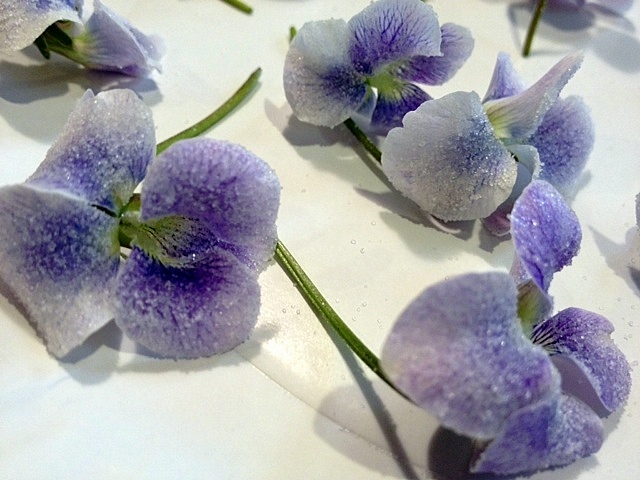 I also piped the frosting, and then topped each with a violet, a task best done right after piping so that the violets adhere well. 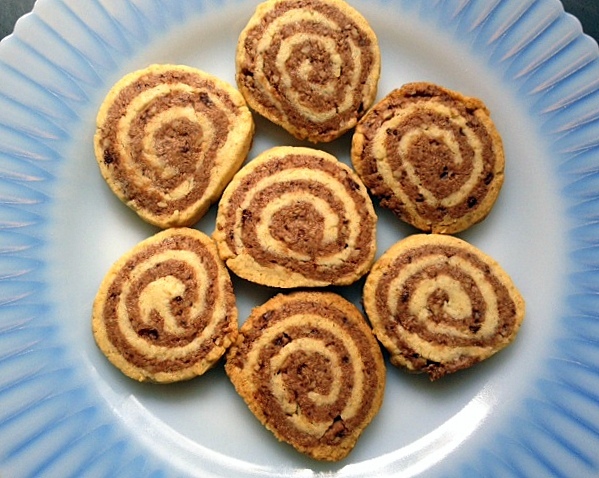 The recipe is on the first page of the chapter entitled Small Cakes, Cookies, Kisses. 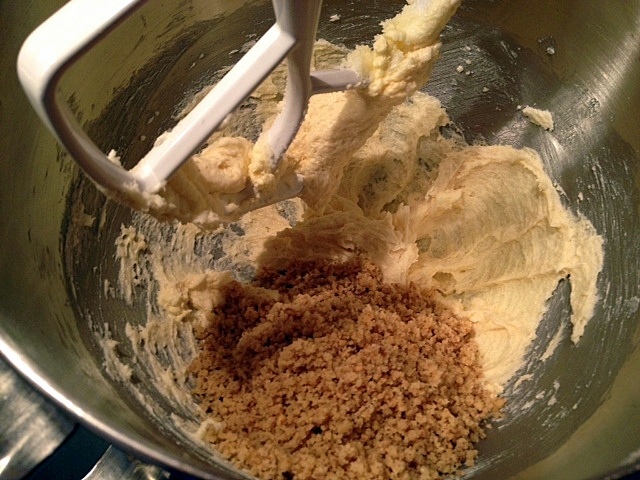 Cream butter and sugar, add egg, and blend. 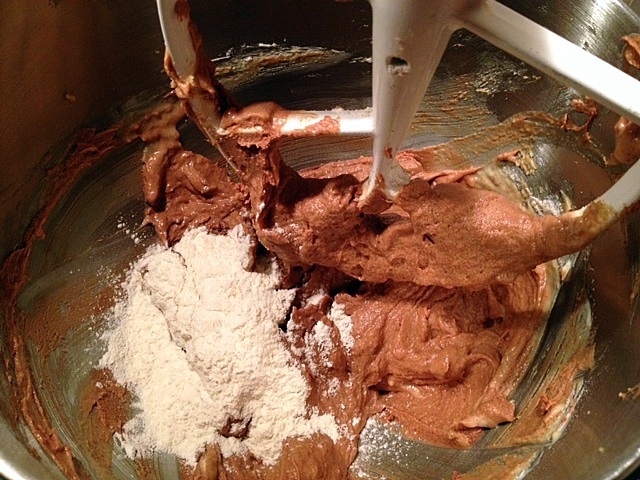 Mix in chocolate. 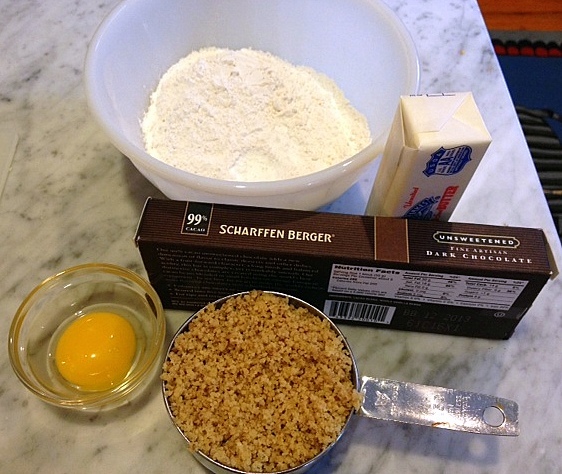 Add flour and baking soda (which have been mixed together) alternately with the buttermilk (sour milk) beginning and ending with the flour. 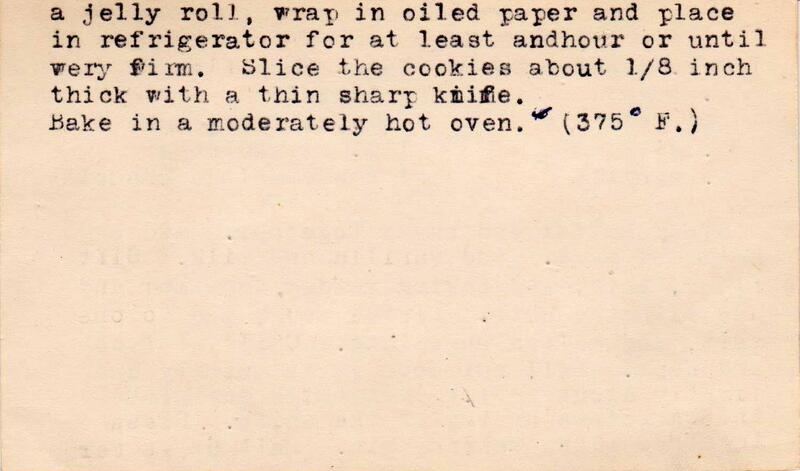 Place in small greased (or paper lined) muffin tins, bake in a 350 degree oven for 10 to 15 minutes. How could I resist a recipe whose title includes the words: Delicious Party Cookies. So even though it was Sunday morning and my weekend partying was behind me, I decided to take the plunge. 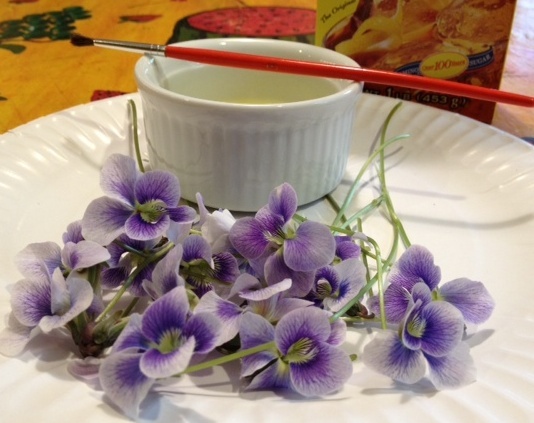 Within an hour (did I mention how quick and easy these are), I was having a party in my mouth, albeit for breakfast. 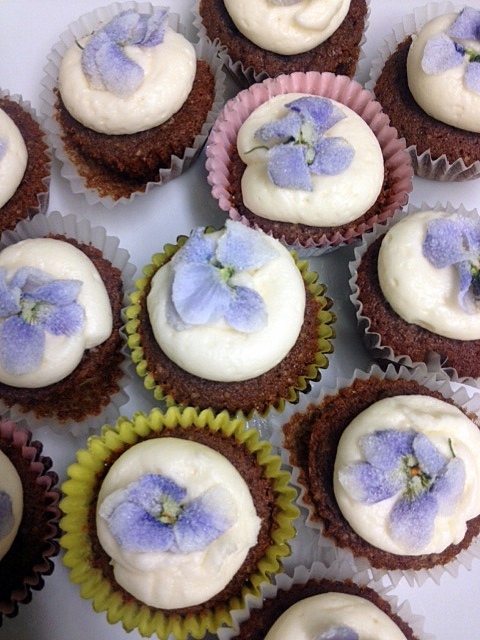 I thought these were pretty good, but then Johanna, a work colleague who has sampled nearly all the desserts I bring in, called me up -- in the middle of a deadline -- to rave about these. Maybe they're even better than I thought. 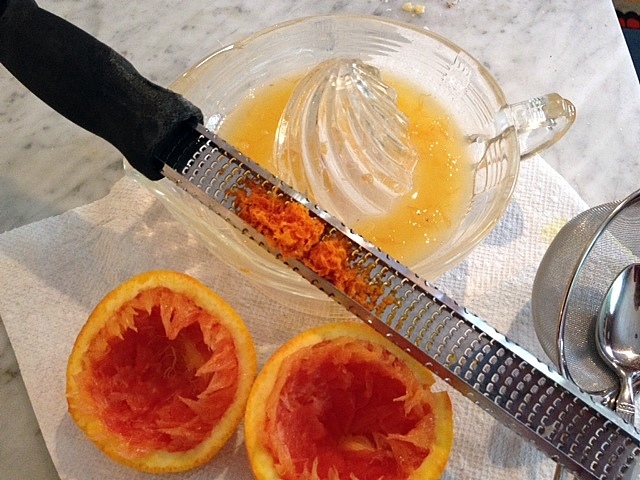 The orange zest is the frosting is not only decorative, but adds a flavor note that contrasts with the very sweet frosting. 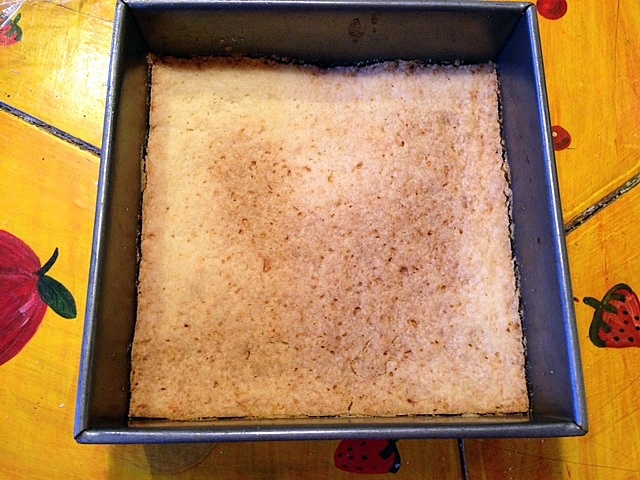 Orange bars are three-layer bar cookies, but the base -- a shortbread-like confection -- isn't that distinct in the finished product. 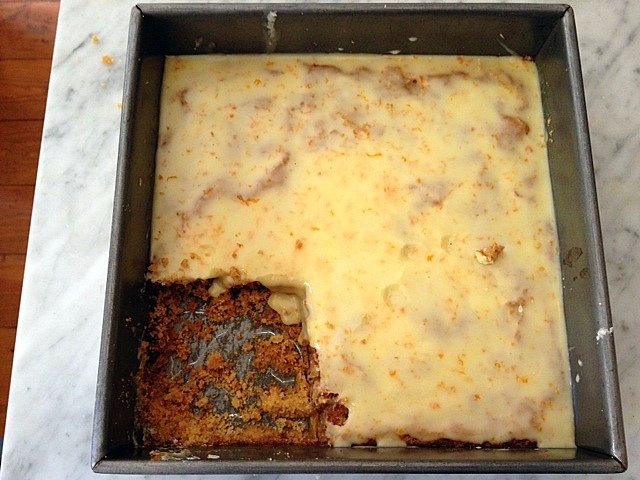 The center is a soft pudding-like cake and the top is an orange-infused confectioners sugar based frosting. 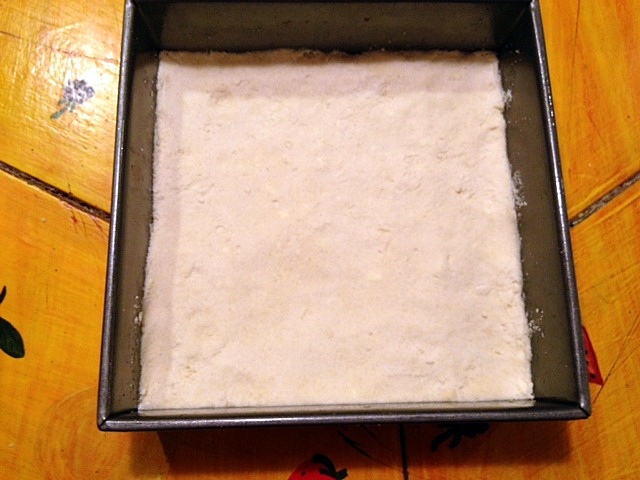 The base is made like pie crust, i.e., the fat is cut into the flour. 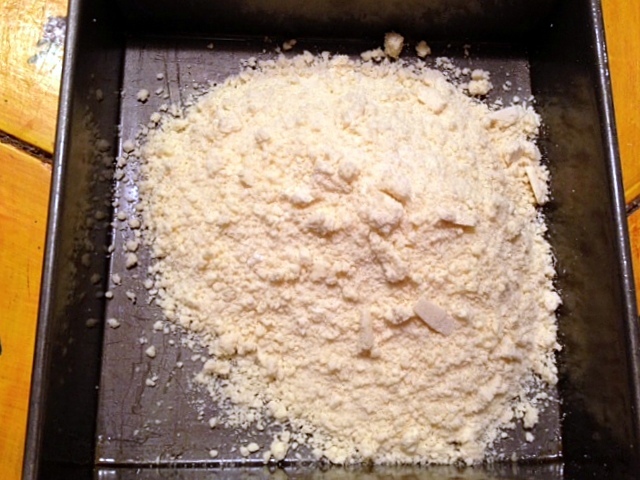 A food processor makes quick work of this task. 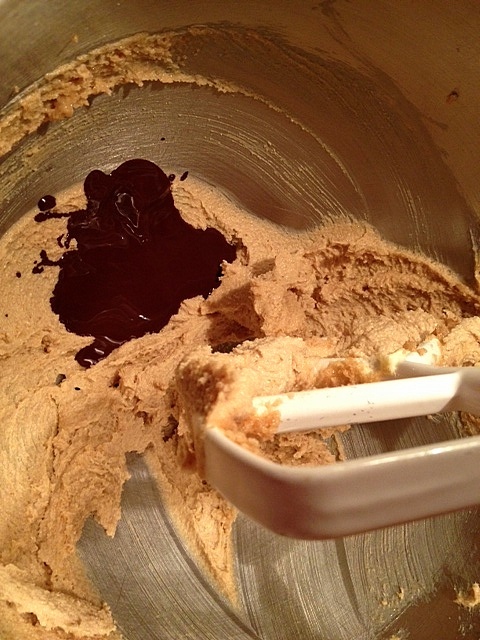 and press it down into place with your hands or the back of a large spoon. 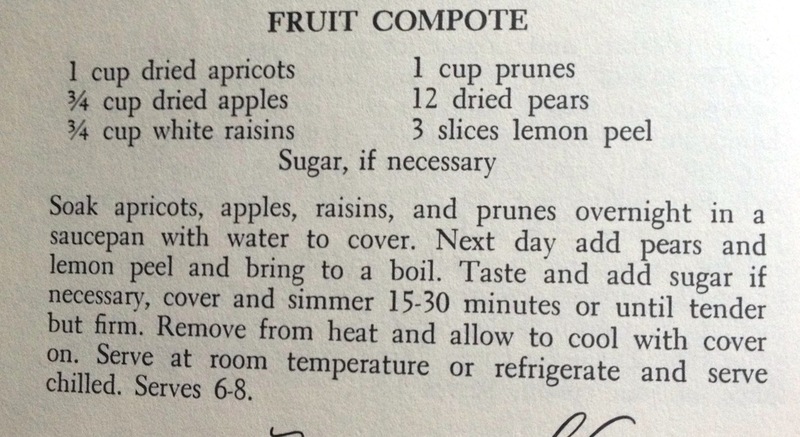 Bake it for about 20 minutes, or so. 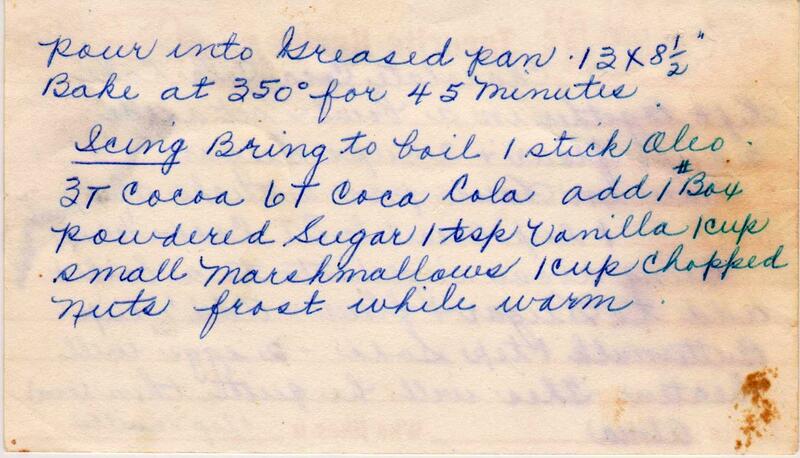 The crucial information as to exact time is missing on the recipe card. 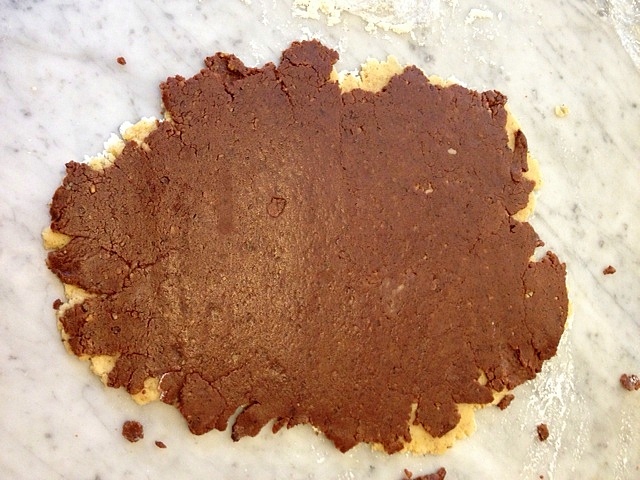 While the base is cooling, prepare the filling. 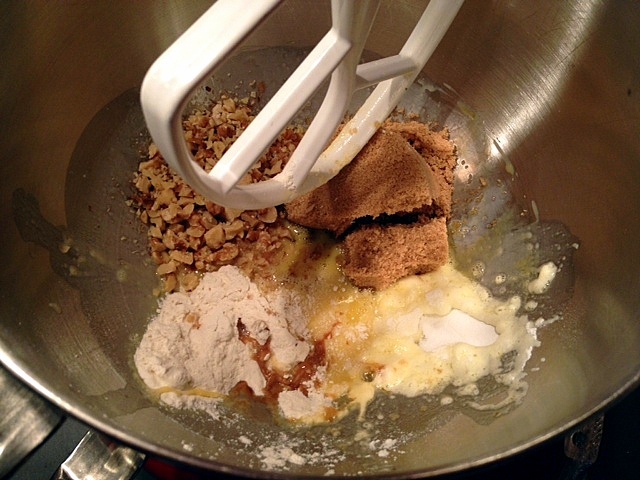 Yes, it's true -- just put all the ingredients in a mixing bowl and combine. This could not be simpler. 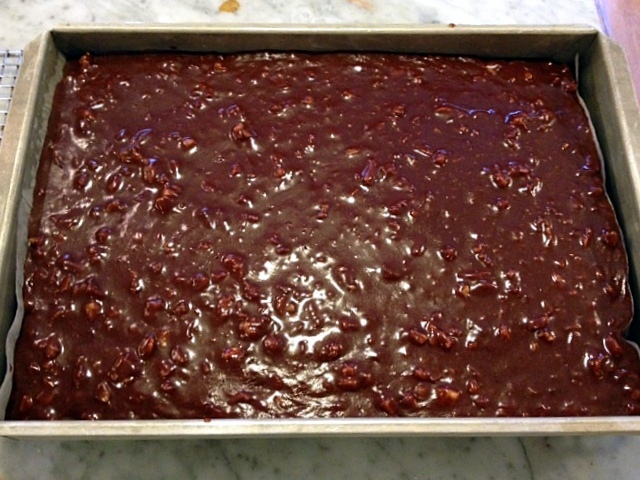 Pour the filling over the base and bake for about 25 minutes. The first few pieces are for the cook. 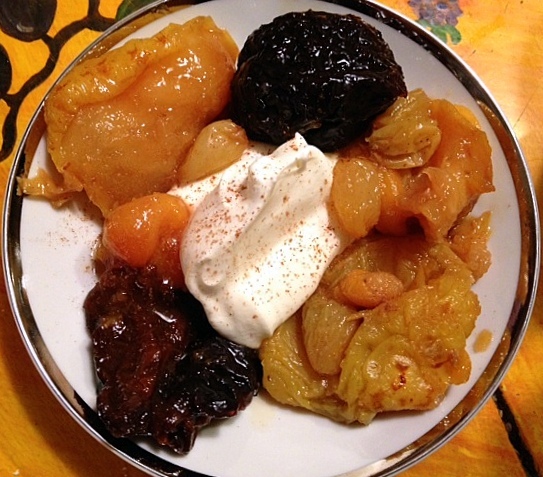 Today's post is courtesy of A Cake Stews in Brooklyn, for that's how this old-fashioned fruit dessert is prepared. 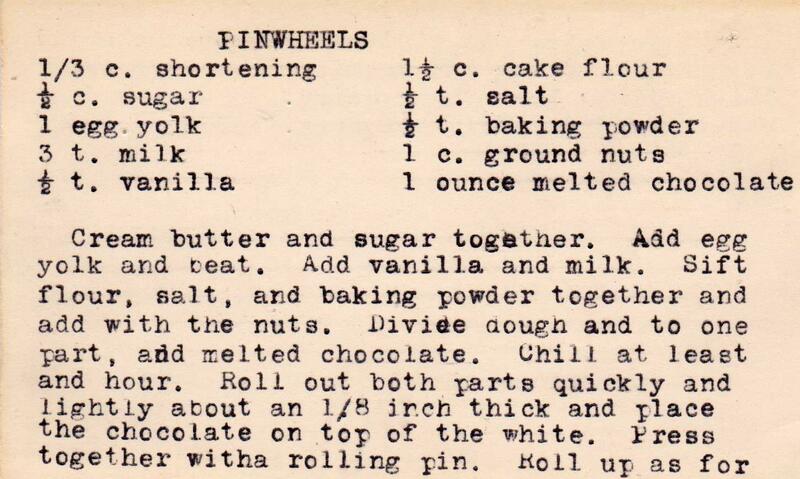 Now, on to the dessert, chosen because it was the only dessert in Hayden's chapter. Fruit compote was served at every family holiday meal during my childhood, but I'd never made it. 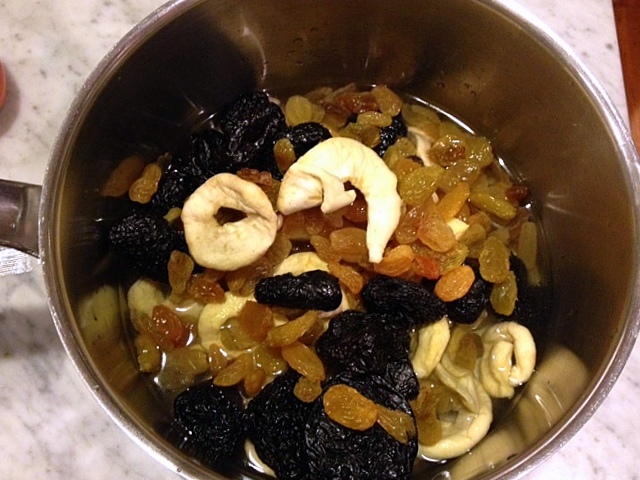 It's very simple -- buy high quality dried fruit, soak overnight and simmer it for about 15 minutes. It's quite delicious, even if it's not beautiful. 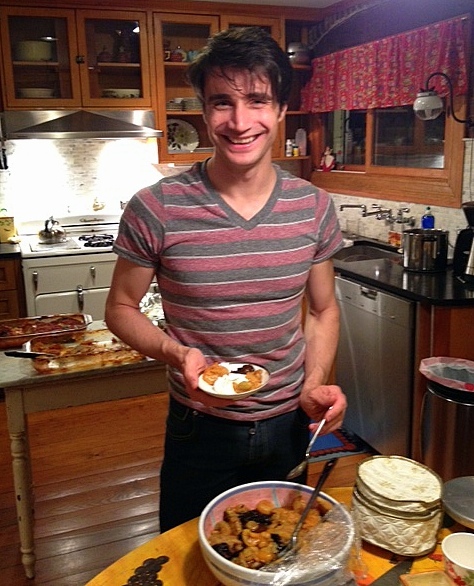 It helps to have Antonio in the kitchen, below, and not only for his ability to plate. The dinner group, taken at the end of the meal. From left, going clockwise: Antonio; Jeff Gageby, who has become quite the sous chef and whose all-around help is invaluable; Ryan, Meryl, Paul Epstein, a longtime family friend of Hayden's and Stuart's; Michael Pereira, Antonio's lovely partner who keeps us all honest and entertained in the kitchen; Garry Parton, Paul's partner; Stuart, and me. And below, is Antonio's fabulous video of the event. Be sure to watch until the very end to see the amusing outtakes. 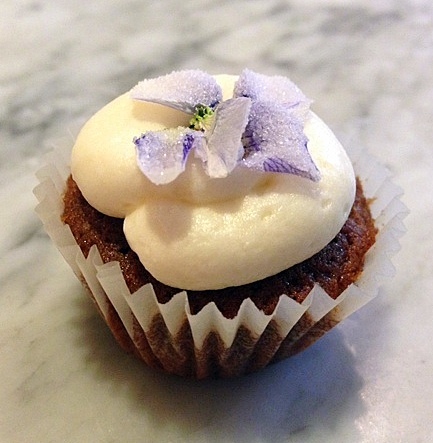 Want to feel really good today and have your faith restored in the food business? Read this. The story, which originally appeared in Policymic.org, is pasted below. Link is at the end of the article. "Cory, My name is Howdy Holmes; I'm the CEO of Jiffy mix. Why don't you give me a call at ...." I could hardly believe my ears. There on my non-smart phone voicemail was a message from a Formula Atlantic Racing Champion-turned-CEO of the $100 million per yearmarket-leading company in prepared baking mixes. What could I possibly have done to deserve this honor? I simply had written a short note complaining that I preferred the flavor of real blueberries to the artificial ones in their muffin mix. 1. 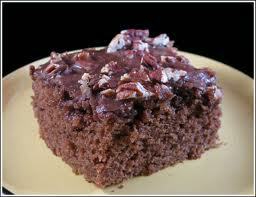 Jiffy mix sells over 55% of all muffin mixes in the United States, but doesn't spend a dime on advertising. While Jiffy competes by selling quality products at the lowest price (40 to 60 cents for corn muffins, for example), most American companies now try to sell their products by making people feel inadequate. "Buy our products, or you won't be happy or sexually fulfilled" is the implicit message that lies to us each time we turn on a TV or catch up on the latest news. Instead of trying to convince us what we should want, Jiffy simply does the right thing, and works to meet a genuine need for convenient wholesome food. The 30% to 52% off the final price that Jiffy saves not advertising or making flashy packaging is directly passed on to customers in the form of unusually low prices. 2. Jiffy mix denies Wall Street a chance to make money from other people's work. Wall Street finance has increasingly morphed from being a source of investment in America, wisely allocating scarce resources, to being a predator "landlord" that makes money off of other people's work. Jiffy mix is a family-owned business that has repeatedly refused debt-financing and lucrative offers to hand the business over to a corporate conglomerate backed by a big bank. As CEO Holmes said in our phone conversation, "I didn't want a 28-year-old brat from Wall Street telling me how to run my company." For Holmes, keeping local control of the company is about much more than stubbornness or pride. Keeping Jiffy mix away from the financial elites is a major contributing factor to their customer loyalty, and the quality of life in their neighborhood. 3. Jiffy mix management treats their employees the way they would like to be treated. Not only does the CEO know most of his 350 employees on a first-name basis, he also has compensated them well, including giving some stock-ownership in the company. With an average salary for a production worker of $47,000 per year, the median family income in the little town where Jiffy mix is $72,266, which is $20,000 more per year than the median U.S. family income. While a Wall Street investor would want to lower this "unnecessary" labor expense, Holmes believes caring for his community and workers is what good business is all about. 4. Jiffy mix genuinely serves their customers needs, instead of being obsessed with profit. Almost any analyst could tell you that Jiffy mix could make more profit by raising their prices. However, as CEO Holmes explained to me, "Most Americans don't have two homes or much extra money to spend on things that aren't necessary. 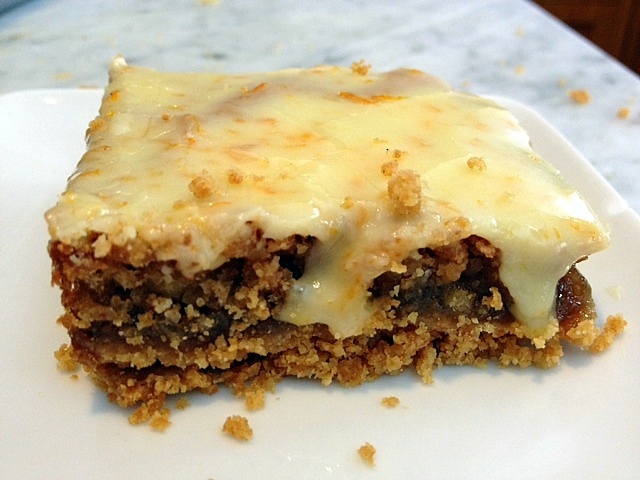 We provide high-quality ingredients at the best price to help as many customers as possible." From an economist' perspective, raising prices close to the level of competitors would maximize profits, but it would also erase an even larger amount of consumer surplus, thus creating a dead-weight loss for society. 5. Jiffy mix staff find meaning and purpose through their work. When I commented on Holmes' decision not to sell off even part of his multi-million dollar company, he said "What would I do if I sold-out? Spend my life vacationing somewhere?!" The CEO of Jiffy has the right attitude. Our occupations, in balance with our relationships, give our lives meaning. To work a job just for money or to escape from community and family responsibilities is shallow at best. 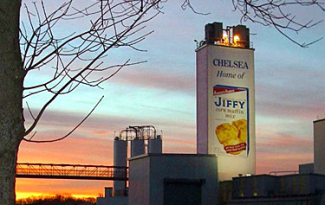 A visiting reporter from Fortune magazine described Jiffy mix as "a decidedly chipper workplace, with friendly employees who seem to be genuinely enjoying their jobs. They greet Holmes warmly, he appears to know virtually all of them by name, and none of it feels phony." One of the saddest trends in American culture today is the growing disconnect between making money and producing value. Many of our best and brightest minds shuffle paper and money for financial institutions to earn big salaries, while the real creators of wealth — bakers, builders, farmers, inventors, teachers, designers, and doctors are loaded down by debt. Jiffy mix is a welcome trend-breaker. According to CEO Holmes, "Our staff puts more emphasis on internal and external relationships than we do on completing tasks. This is very different from most companies ... Our dedication to strong family business values, combined with real world professionalism has us uniquely situated for the 21st Century." 6. Jiffy mix is honest. Instead of hiding their cost-cutting techniques in the small print ingredient list, Jiffy announces on the front of their Blueberry muffin mix package that their product is "artificially flavored with imitation blueberries." 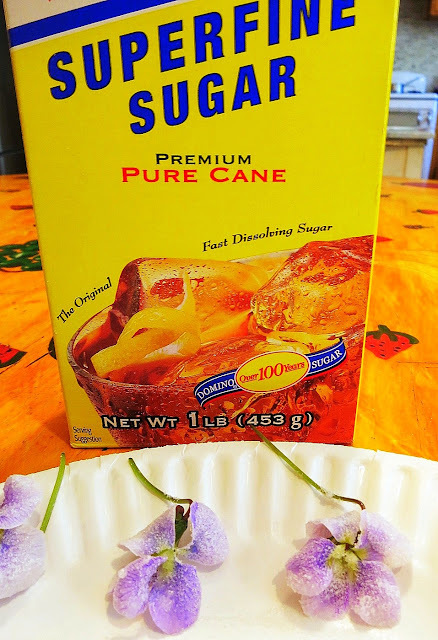 This behavior is a clear contrast to Betty Crocker's Premium 'Wild Blueberry' muffins that cost more than twice as much as Jiffy mix, but douse their "real blueberries" in high fructose corn syrup and artificial flavors. Holmes told me that Jiffy mix "has even won accolades for being more honest than required in packaging our products." 7. 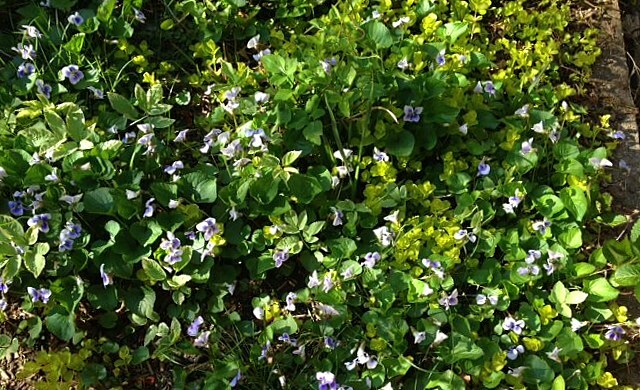 Jiffy mix makes long-term decisions to benefit future generations. With no concern for investor's short-term expectations of profits, Jiffy mix just invested over $6 million into a new research and development facility as part of their plan to keep the company going for many more generations. While other American corporations do invest in research, this essential business function is declining in the United States. CEO Holmes has concluded that long-term thinking is one of the key differences between family-owned businesses and other companies. One of the world's most widely recognized ethical standards is to do to others as you would have them do to you. By separating the owners and executives of companies from the communities where these same companies do business, the corporate structure of business has increasingly lost sight of this traditional American ethic. Cutting employee benefits and jobs to enrich Wall Street has become almost as common as hidden fees, and hiring lobbyists to gain unfair competitiveadvantages. Small businesses and exceptional American companies like Jiffy mix, built our country'sonce-broadly shared prosperity. Sadly, thanks to Wall Street greed, large civic-minded companies are a dying breed. If all companies were as ethical as Jiffy mix, then most Americans could support the far right agenda to get rid of all the regulations. The best solutions are, of course, not so simple. We need commonsense protections from corporate abuse at the same time we need to scale back regulations that exist primarily to give big businesses advantages over competitors. Because, so few companies are like Jiffy mix, America needs a smart government of the people, by the people and for the people. Some may ask, If a tree falls in the forest and no one is around to hear it, does it make a sound? 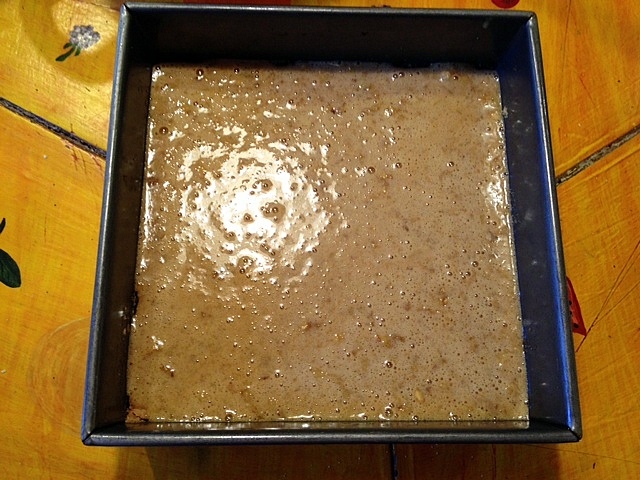 In the Cake Bakes kitchen (not a place known for metaphysics) we had to ask ourselves, If a cake is baked and not photographed, did it really exist? Yes, this happened last weekend. As I entered the kitchen to photograph the last slice of Chocolate Coca Cola Cake, there sat the DH (with the telltale crumb on his chin) and an empty plate before him. Chocolate Coca Cola Cake is filled with all sorts of "bad" ingredients: cola, miniature marshmallows, etc., but the end result is quite delicious. It's origin is said to be southern and, though I've never been to a Cracker Barrel restaurant, I've heard it's a dessert item there. 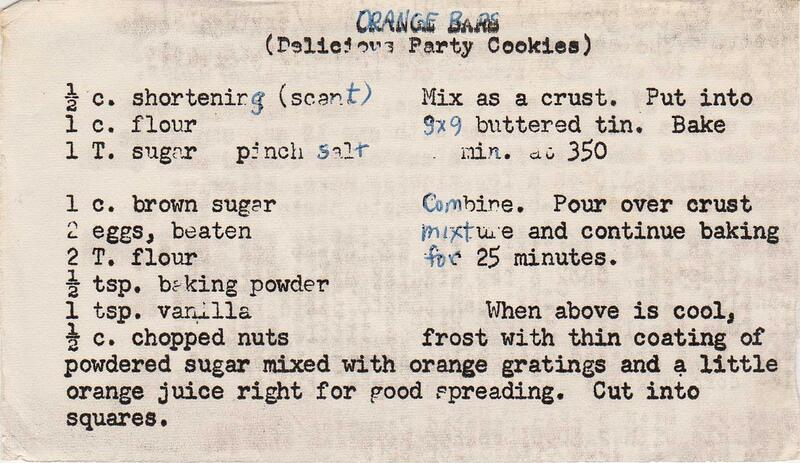 I served this at Peaster (our Passover Easter holiday mash-up celebration) and it was *very* well received. One thing that distinguishes this cake is that many ingredients in the cake (butter, cocoa, marshmallows) are also used in the frosting. 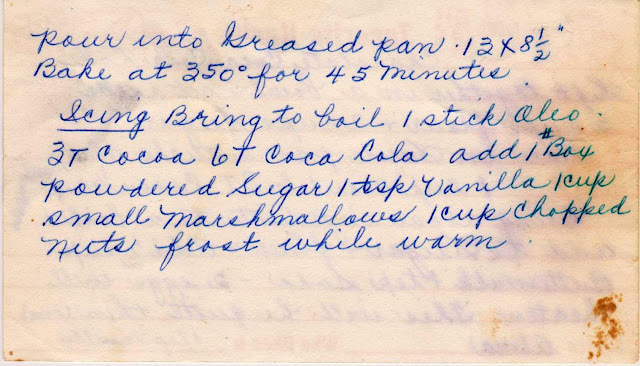 Also unusual, is that both the cake and frosting are started on the stove top, and not in the Kitchen Aid. 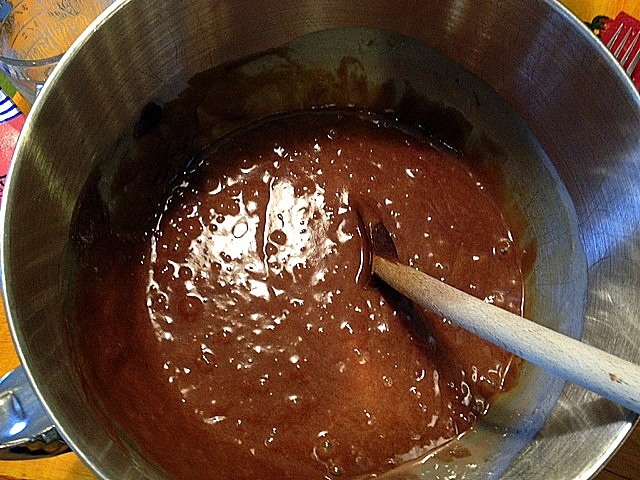 Start by placing the cake ingredients in a saucepan. 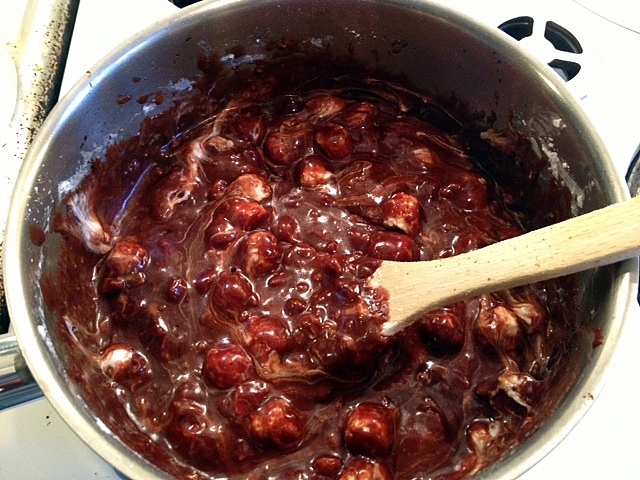 Stir until well combined and the marshmallows melt completely. 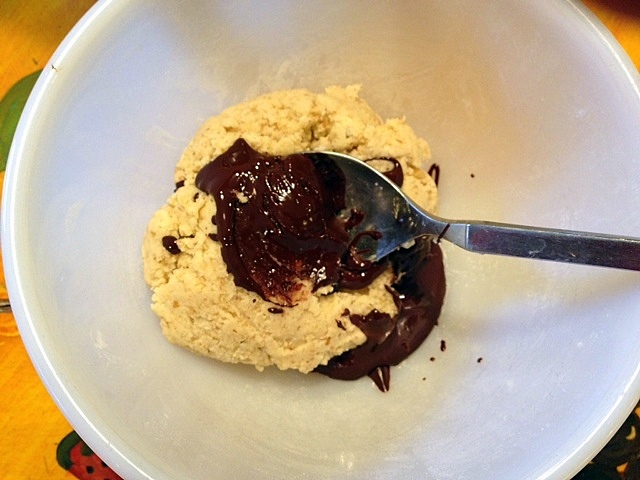 I transferred the mixture into a bowl before adding the flour and other dry ingredients. 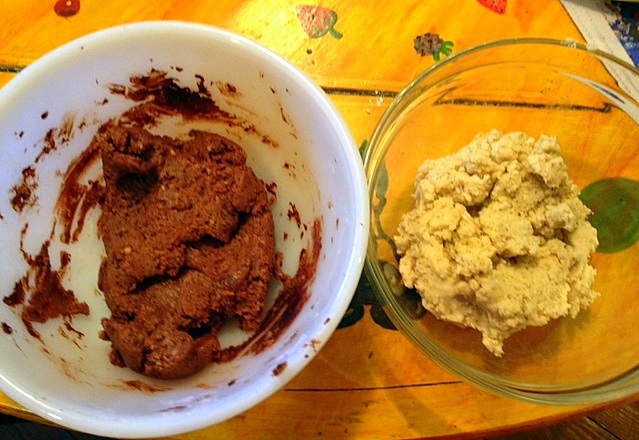 While the cake is baking, start the frosting. 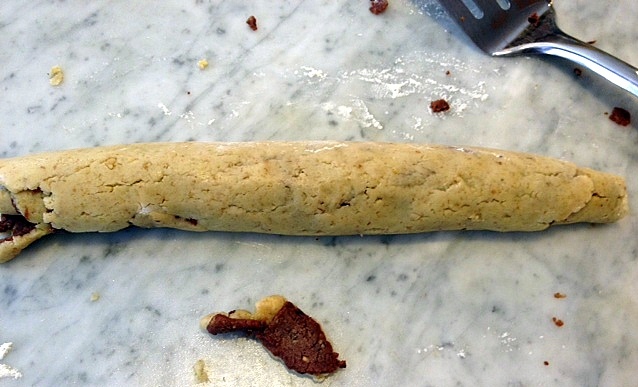 It will look a lot like the batter (but uses only one stick of butter). 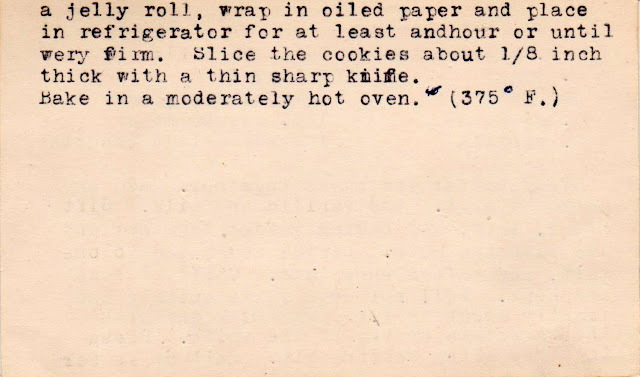 The recipe, credited to Alma, was in a large collection of Amish recipes I purchased a few months ago.